Magnetic susceptibility is an electromagnetic technique which assesses the ability of the topsoil or ploughsoil and features within it to be magnetised. This ability is largely related to the existence of certain mineral types which can be magnetised. Mineral types and their abundance are controlled by a combination of bedrock geology, glacial history and ancient and modern landuse. Burnt debris and also the incorporation of settlement and industrial waste in soils can enhance their magnetic susceptibility value. 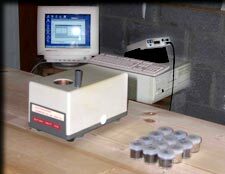 The technique can be used for field measurements, shallow borehole measurements and on soil and rock samples in the laboratory. In field surveys the depth of investigation can be from 0.1 to 1m depending on the nature of the site or area and former and current landuse e.g. 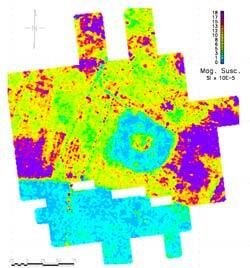 deeply ploughed soils can provide results from deeper levels. Field magnetic susceptibility surveys at an appropriate sampling scale can be used in the reconnaissance assessment of large sites. The interpreted data are then used to design a detailed geophysical survey strategy for areas or zones of enhanced magnetic susceptibility. The technique is often used to complement detailed magnetic gradiometry surveys where it is also used to define target areas and assist in the interpretation of the survey results. In detailed archaeological surveys and excavations field and laboratory magnetic susceptibility measurements can be used to map individual features or contexts and to select soil samples for further environmental analysis. 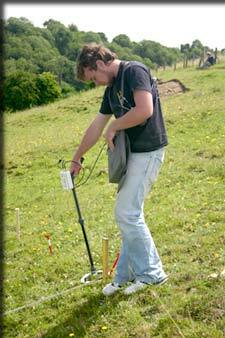 Laboratory measurements can be used in a prospection strategy to assess possible archaeological activity or enhancement within the topsoil in advance of detailed field surveys or as a complement to them.